Manufacturer of a wide range of products which include manual cement feeding system. Being the recognized name in the firm, we deliver world-class array of Manual Cement Feeding System that are valued for smooth texture and immaculate finishing. Our entire range is delivered in standard sizes and ensures wide application. Our entire range is environment friendly in nature and is able to meet the diverse requirement of the clients with ease. 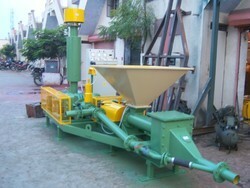 Manual Cement Feeding System is used in construction applications.